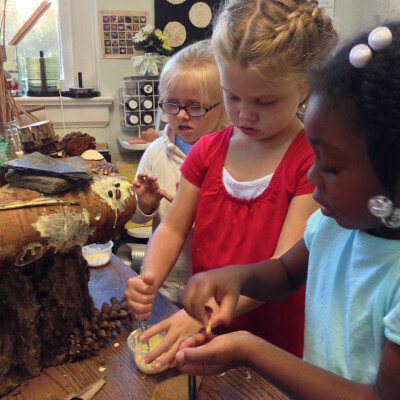 This is a story in which dialogue becomes important to the play in the Outdoor Classroom, and in which play in the Outdoor Classroom becomes an element in the culture of the class. 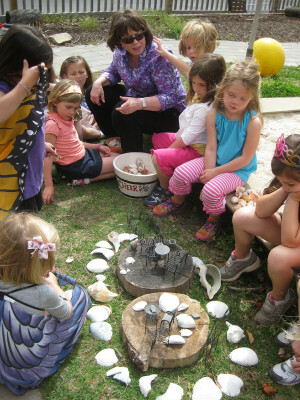 Early in the year, a member of our larger community came to make a fairy house with the children. 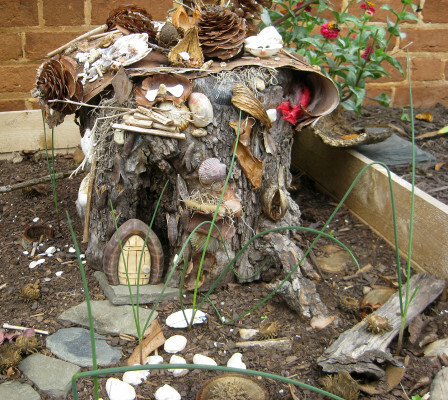 Fairy houses are this adult’s passion, and she volunteered to make one with the children during the first weeks of school. 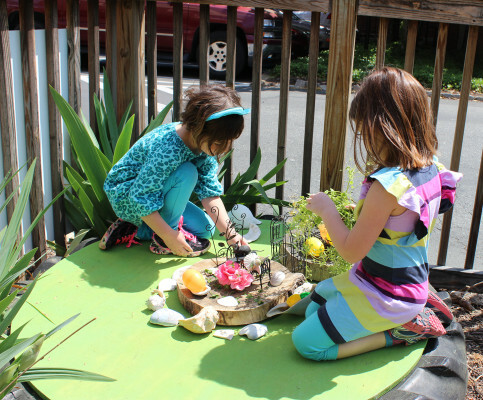 When the fairy house was finished and installed in the Outdoor Classroom, the children created a fairy garden around it. Then they deconstructed the garden, and constructed it again, over and over. Every now and they made little gifts for the fairies…a table set with food for the fairies (often made from the little banana peppers growing in the garden), a place for fairies to play, or written invitations. C writes, “This is a fairy house for you.” Then she added, “Did you give us this door?” A few days earlier, a door for the fairy house had mysteriously appeared in the fairy garden, and the children were interested in trying to figure out who had left it for them. C left a piece of chalk out for the fairies to use if they wanted to respond. The idea to invite the fairies to the garden deepened one day in November, when H and G had the idea to make a fairy trap in the small sand box across from the fairy garden. They found lengths of wooden cove molding in the shed and installed them vertically in the sand. It was their intent to cover the structure with a net, to capture the fairies so that they could see them. The fairy trap construction begins. The girls worked all through our time outdoors and, when it was time to leave the Outdoor Classroom, they requested a meeting of the class so that they could ask that the children not disturb the trap. I don’t believe they expected controversy over their structure, but the children engaged in passionate dialogue about the trap, including a great deal of “problematizing” and ideas for solving the problems. When H explained to the group how the trap would work, the children had other ideas. H: There’s gonna be a net over it and it will fall down onto them. MM: But the fairies will see that it’s a fairy trap, so they will just run away and fly away. H: Well, what we’re gonna say is “company please,” so they know we want company from fairies. J: But what if the fairies are hearing us right now? EK: They wouldn’t want to come. H: But the fairies are in outer space, G said. H: They’re all the way, like, northern. LT: We don’t want to scare them. H: But it’s gonna make them come overnight. And we would all be asleep. MM, whispering: We’ll make a sign. All together on cardboard, and we’ll write it. EB: No, then they’ll be scared. It could just say, “Fairies,” and they will think it’s a birthday. LM: What if we have a sign that [says], “This is just another part of the fairy house,” and then they’ll get in it, and we could trap them until tomorrow, and we could see them. They might even listen to us, because what if we don’t do anything and just be really quiet tomorrow, and we’ll pretend like we’re a statue, and then they’ll come and we could see them. Teacher: Do you think that would work? MM: What if we look with magnifying glasses, and, if we see one, we be a statue? H: They’ll see our eyes moving. AE: No. Let’s just make our eyes be still. LW: We could close our eyes. J: But what if the fairies were behind us. We couldn’t move our head and just look behind us. Then they would float in front of us, and then we would look in front of us, and then we would look behind us…(J demonstrates swinging her head back and forth…in a gesture of futility?). MM: If your eyes are closed you’ll have to open them to see, and then they’ll run away when we open them. H: What if we made a trail of fairy food, and then they would follow it, eating all the food? And whenever the food trail is gone, we know that a fairy [has been] here. AM: If we hide and keep an eye out for them, they’ll come to the fairy house. MM: I think we should tiptoe in the morning with quiet feet, and we can open our eyes, and we can see them. But we can’t move. But when we see them, how can we get back out walking? LM: I don’t think we could do it anyway, because we’re dressed up in clothes, and they’ll think we are persons because we are dressed up in clothes and we’re colorful and we can’t be a statue if we’re not grey! MM: We can dress up and disguise [as] grey. Or we could climb a tree and see them. In that way our time outdoors ended for the day, with H and G’s project now public and protected, but beset by questions the two had not considered before. The next day, several children joined H and G to build the fairy trap. They found that the wind had blown the pillars over in the sand, and so they had to begin construction anew. Some of the children took on the problem of how to suspend the net (reduced from the original vision of a giant net to a small bug-catching net). J tied a piece of flagging tape to the net…but what to hang it from? There is no ceiling outside. G: We can hang it from here. J: No, it’s not tall enough. J and G decided to create a structure from which to hang the net. They pushed two pillars into the sand with the plan to then bridge the gap with another pillar and hang the net from the cross-piece. But once the cross-piece was installed the structure fell on Harper. It was back to the drawing board. The physical fairy trap never did work well. The children realized that sand simply isn’t a good foundation for the pillars. However, despite a lack of any physical reminder of the first trap, the idea lived on for months, from November until the end of the school year. 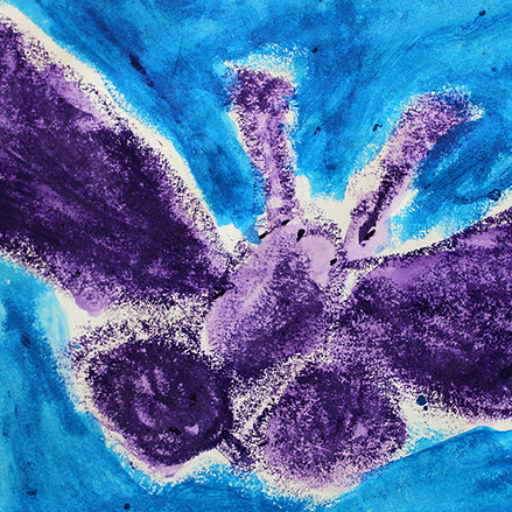 The children made many iterations of the trap into the Spring. And they spoke of “the fairy trap” as if it were a specific entity. And I suppose it was, in a way, having been woven into the fabric of the culture of the class. We often aren’t aware in the moment that a particular idea will develop a role in the culture of a class. But the passion of the conversation with which this story began could have told us that this was one such idea. 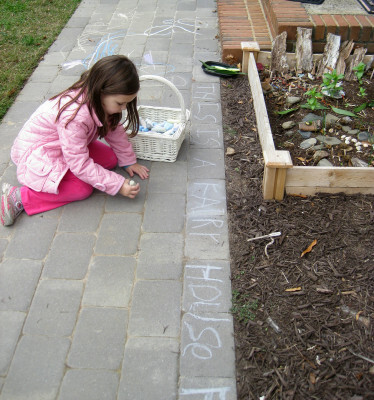 A fairy egg hunt is built to lure the fairies in.